- Additional oil weights available, call for details. 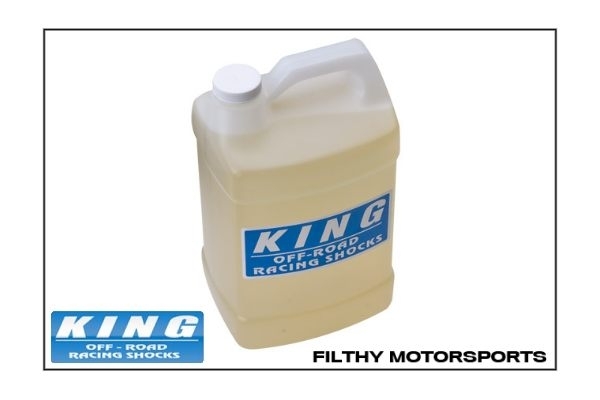 King Shock Oil is the correct oil type to refill all King Off-Road Racing Performance and Pure Race series smoothie, coilover, and bypass shocks. Specialized King air shock oil is also available for King air shocks, air bypass shocks, and bump stops. How much shock oil do I need? One gallon of shocks oil is enough to fill four 2.0 x 14" shock with reservoirs, four 2.5 x 10" shocks with reservoirs, or two 2.5 x 18 shocks with reservoirs. For a more accurate estimate, please use the Crawlpedia Shock Oil Volume Calculator.